A functional refrigerator should keep food at the proper temperature while also keeping energy costs low. We are IceBound HVAC & Refrigeration, and we are Pooler’s experts in commercial refrigeration maintenance, repairs, and installations. When you run into refrigeration issues at work, a lot is at stake. From employees having to deal with spoiled lunches to a busted walk-in cooler during dinner rush hour, there’s a lot that can go wrong. Our refrigeration company is here to help things run smoothly and get back to normal. Keep your business running without hiccups or problems — schedule all of your commercial refrigeration needs with IceBound. Why Does My Business Need Commercial Heating? If your commercial refrigerator or freezer isn’t functioning at its best, your energy bill will be higher. We’ll give you recommendations on how to lower your costs. Food needs to be stored at 40 °F or below in a fridge and 0 °F or below in a freezer, otherwise bacteria can grow and people can get sick. People won’t dine at your establishment if they know that proper food safety measures aren’t being taken. Our team can install energy-efficient refrigerators and freezers to help lessen your business’ carbon footprint. IceBound HVAC & Refrigeration can assist in a number of ways to help your commercial refrigeration function at its best. Ice and frost buildup, unusual noises, a motor that’s excessively hot, these are all signs that your commercial refrigerator or freezer is in need of a tune-up. You’ll want to get things fixed right away, before your appliances collapse completely. It might seem like you’re paying money right now, but you could end up saving hundreds (if not thousands) of dollars from not having to throw away spoiled food and losing customers. Not to mention, needing a new commercial refrigerator can be a huge setback for business and take away tons of hours of prep work if you suddenly need a replacement, without warning. If something seems off with your commercial refrigerator, don’t delay — call our refrigeration company to address the problem ASAP. Ideally, you’ll have an idea of when you need a new refrigerator. The last thing you want as a business owner is to suddenly be without a refrigerator or freezer, waiting days for a new one to come in. That’s countless dollars lost for something that could have been replaced in a timely and predictable manner. IceBound can give you a timeline of when you’ll need a new refrigerator, helping you stay on track and plan ahead. Plus, we offer installations on energy-efficient refrigerators and freezers, which can help you save money on bills. If you have our team come in once a year to perform a routine refrigeration check, you’ll know what to expect with your appliances and will be able to plan for the future. You can start saving now for the fridge you’ll need in a few years, making your budget, expenses, and customers happy — as well as helping your business as a whole. IceBound isn’t just a refrigeration company, we’re an HVAC team as well. 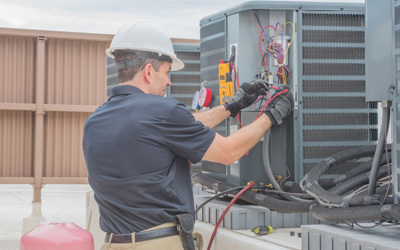 You can schedule all your commercial needs — such as heating and air conditioning — in one fell swoop with a checkup from us. Don’t let your refrigeration run your life. Take control by knowing what to expect. Plan accordingly and help your business continue to thrive. Give us a call for commercial refrigeration maintenance, quality checks, and installations — we look forward to working with you.